Keeping your boat in pristine shape not only feels great but it’s also good for engine efficiency and resale value. Since boats are exposed to a wealth of dirt mold and grime, keeping your boat clean is an important part of boat ownership. After a long day out on the water, the last thing you want to do is scrub, wipe and use a squeegee on every inch of your boat. The team at FishingLicense.org encourages all boat owners to stay motivated after docking at the end of the day, so they can take great care of their vessel. Learning how to clean your boat quickly, efficiently and easily may help you to keep that motivation and get the job done. Here are a few tips for cleaning your boat that’ll make this hassle seem more effective, simple and fast. One of the most annoying parts in the task of cleaning your boat is gathering all your cleaning tools and products. Creating a cleaning kit for yourself that you keep in one handy spot can avoid the annoyance of hunting for all the things you need for a successful cleaning. Some boaters have even found it beneficial to use a product caddy or plastic bin that houses everything they need for a good boat cleaning. The team at FishingLicense.org recommends only including bottled cleaning products in a bin that’s enclosed and has a lid. If you add your damp sponges or cloths to an enclosed bin while they’re still wet, they can start to grow mold and stench. You want all cleaning tools to be fresh and clean so they don’t transfer this smell to the surfaces of your boat. However, if you’re using a caddy or open bin, these materials should still be able to airdry on their own while staying organized. You’ve been out fishing all day with your friends and you can’t wait to fillet up your fresh catches, and relax. Even though you’re exhausted, it’s important to not neglect the cleaning of your boat. 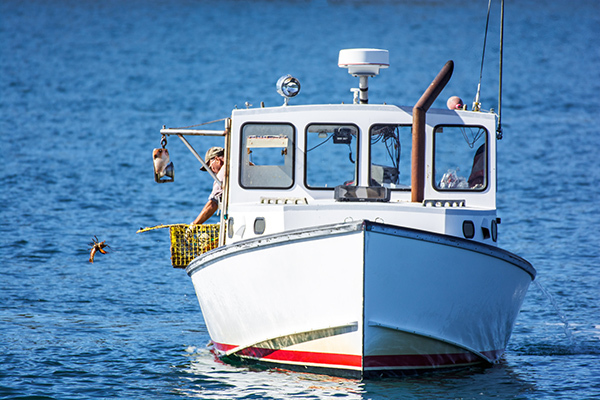 Many fishermen tend to rush through a boat cleaning so they can be done with it for the day. However, it’s crucial to give some attention to your live wells. If you had fresh bait in your boat, the wells need to be emptied and drained, then cleaned. Leaving your live wells wet can cause them to build up mold and start to smell. This smell can lead to an unpleasant boat ride, and can make you and your guests have to hold your nose when reaching for bait. Letting your live wells stay dirty can also lead to discoloration. The team at FishingLicense.org warns that if they’re left long enough, no amount of scrubbing will remove this discoloration, which can affect the resell value of your boat. While your live wells could use a good bleaching, it’s important to stay away from any toxic cleaning products. Using bleach or products with chemicals in them can have a bad effect on the bait you put in the live well. It can eliminate the fish smell you’re trying to preserve for your bait, and can even kill some live bait. Use completely natural but effective products when cleaning your live wells, like baking soda. Even if you’re just giving your boat a once over after a day on the water, take the time to look around and spot treat as needed. If you see discolorations, stains, or an area that needs a little extra attention, don’t save it for later. Walking around with a spray bottle full of white vinegar and a cloth and attacking all dirty spots you see will keep your boat in great condition for much longer. The experts at FishingLicense.org urge all boat owners to spot treat their interior and exterior after every ride. Getting rid of any spills or stains right away can prevent permanent damage from sticking around and ruining the aesthetic of the boat for good.